How Reading-Aloud Made Me the Teacher and Person I Am Today. This is a wonderful real life story of how an amazing teacher, Jennie, gives voice to children by reading aloud and helps to create a love of learning through reading. It also makes a world of difference for parents to give the gift of reading aloud to children as both parent and child learn to share and the memories that are made, create a bond that lasts forever. Thank you, Jennie, and Happy Thanksgiving. My very first day of teaching preschool in Massachusetts, thirty-two years ago, was both career and life altering. Lindy, my co-teacher, asked me to read the picture books to children each day after our Morning Meeting. Sure (gulp)! I was new, scared, and unfamiliar with many children’s books. I had not been read to as a child, except for The Five Chinese Brothers from my grandmother. I still remember the page that opens sideways, with the brother who could stretch his legs. One book, and to this day I remember it vividly. 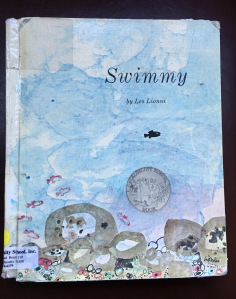 The book I read to the children on that first day of school was Swimmy, by Leo Lionni. It was magical for me, and for the children. The story line, the art, the engineering, the words… it was a taste of something I knew I had to have. And, I couldn’t get enough. Previous Post Happy Birthday to Bram Stoker! Reading aloud is so important. Thanks for sharing this!